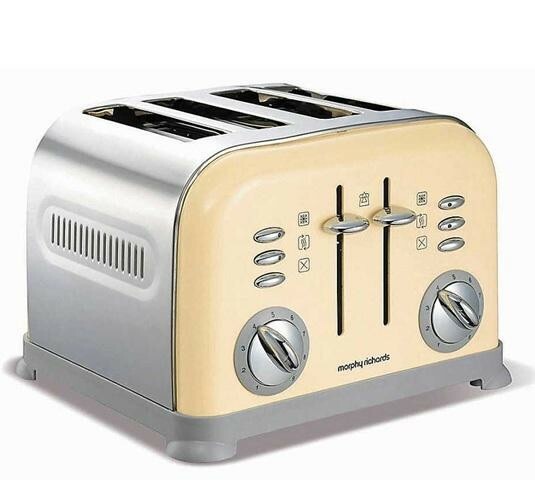 The Morphy Richards 242003 1800W 4 Slice Accents Toaster in a cream colour is the perfect accessory for helping you feed the whole family in the mornings. The 4 slice feature of the 242003 enables you to easily feed the family at once and the variable browning control lets you toast your food to perfection so there will be no complaints. There are many functions on the 242003 including reheat and defrost, these allow you to either reheat your snack without burning it or defrosting your bread instantly. The removable crumb tray enables all the crumbs to be neatly stored in a hidden compartment until emptied, combined with the cord storage, your worktops will always be neat and tidy.